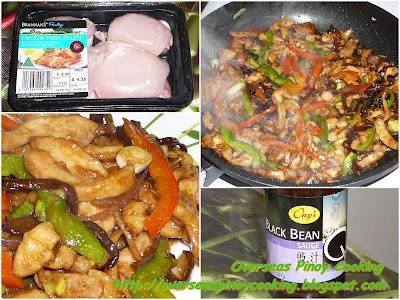 Chicken Stirfry with Black Fungus in Black Bean Sauce, this is my first stirfry recipe for chicken and it was good at the first time. In fact stirfries are easy and quick to prepare. For this chicken stirfry I added the pre-cut-strips black fungus which I still have a bag full of it. It could have been better if I have black fermented black beans or tausi but I could not find from the supermarkets in the neighbourhood. Instead I just used a bottled black bean sauce. I found some Chinese parsley so that makes the sitrfry dish nearly complete. For this recipe I used skinless chicken thigh fillet which for me is better than chicken breast. As I said the cooking is really quick, there is no worries sine the chicken I used are really fresh. Here is the recipe. Place chicken in a big bowl, add in soy sauce and cornstarch, mix thoroughly and let marinate for at least 10 to 15 minutes, keep aside. In a wok stirfry at high heat garlic, ginger, Chinese parsley and onion until fragrant, push in one side. Now add in the black bean sauce, chicken and black fungus and stirfry for 3 to 5 minutes, then mixed in the garlic, ginger and onion, continue to stirfry for 5 to 8 minutes. Season with salt and pepper to taste. Stir in bell pepper and spring onion, stirfry for another 1 to 2 minutes. Remove from wok and serve immediately.